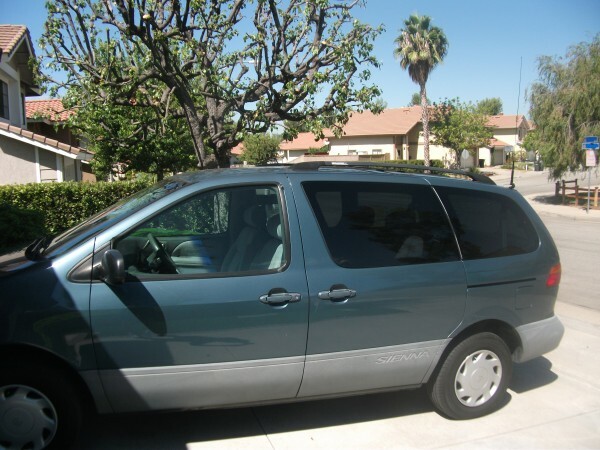 I wanted to have a mobile amateur radio installation in my 2000 Toyota Sienna minivan for trips or for use as a support vehicle for bicycle events, but I didn’t really need a “full time” installation. 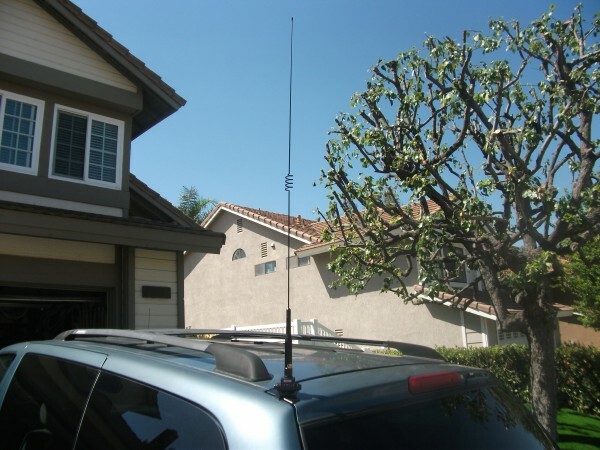 So I went with a “semi-permanent” installation in which the necessary wiring would be in place, but I would add in the mobile radio (which is normally my office “base station”) and antenna when I needed it. 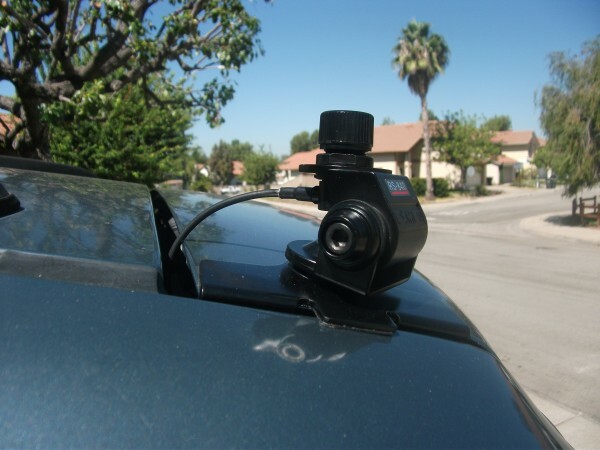 Theoretically, the “best” thing to do is to bite the bullet and drill a hole on the roof to mount the antenna, but installation on the rear hatch is a close second. Plus in my case, there’s a couple of key advantages to a hatch lip mount: (1) no interference with the roof rack or the bicycles on it, and (2) easier installation and removal of the antenna, as it will be off the van most of the time. So I went with the Comet CP-5M mount. (Courtesy of the helpful folks at Ham Radio Outlet in Anaheim.) I left on the screw cap on in order to keep the rain out. Here is a view of the underside of the lip mount showing where the antenna wire disappears under the weather seal. 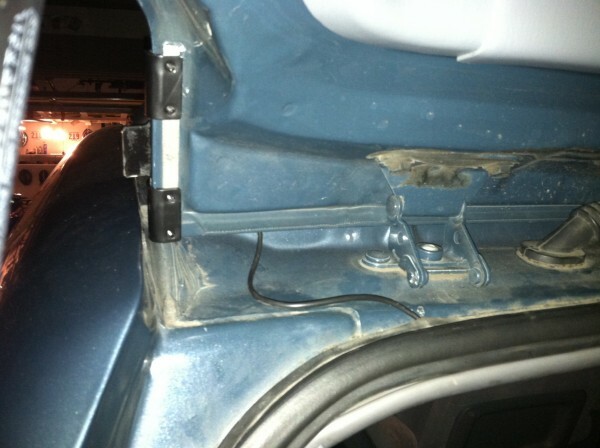 The original plan was to wire into the tail light grommet on the right side of the photo. But the installer (New Age Audio in Fullerton, suggested by HRO, and who I highly recommend!) couldn’t get the fitting off the end of the antenna wire, and neither one of us wanted to make any cuts to the wire. I’ll just go ahead and add silicone sealant where the wire enters the weather stripping, and I should be OK.
Here’s how the Comet SBB-5 antenna looks when mounted. It’s hard to tell in the photo, but it is approximately three feet long. A closer view of the antenna. The mobile radio power supply is direct wired to the battery. 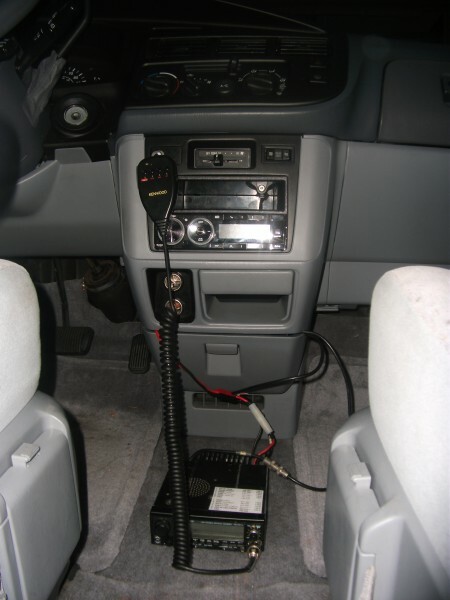 That’s to avoid interference from the van’s electrical components (“alternator whine”), and it also makes it easy to have dedicated fuses in the positive and negative wires. 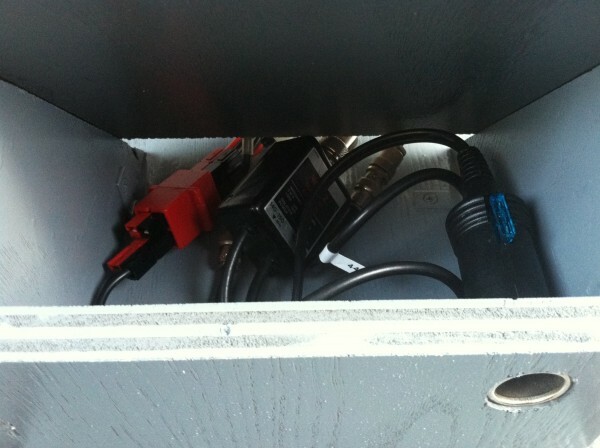 I had the installer put the power and antenna cables into the storage compartment under the ashtray. Tonight I quickly put the radio on the floor as in the photo just to test that everything worked OK. But the radio is a bit low to reach for normal operation while on the floor. The radio is a heavy old dual band Kenwood TM-721A, from back in the days where the radios didn’t have remote faceplates. So I don’t have the option of installing the faceplate somewhere accessible, while mounting the radio itself somewhere else. They have to be together. The challenge here – even for a permanent installation – is finding a suitable location for the radio. I thought of taking the door off the compartment under the ashtray (it used to hold CDs, but it doesn’t need to do that anymore) and using that space, but it is all plastic under there. It’s hard to find a good spot anywhere that’s sturdy enough to support a radio. 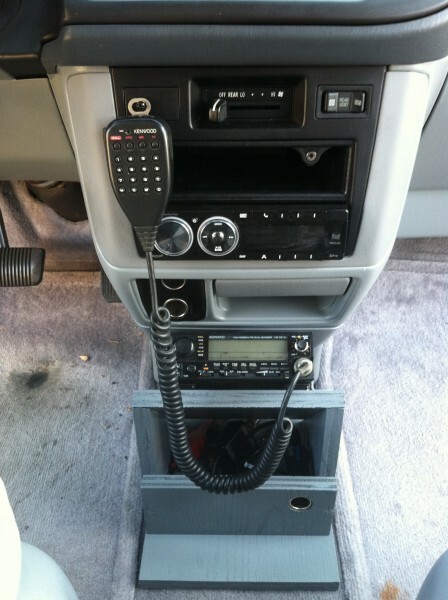 I may need to make a freestanding “box” in front of the center console for mounting the radio. Update 9/27/12 – I tried looking for aftermarket consoles for the radio, but no luck finding a good one. So I’ve made my own console! Cutting the wood. After much spray painting, finally a finished product! Side view. 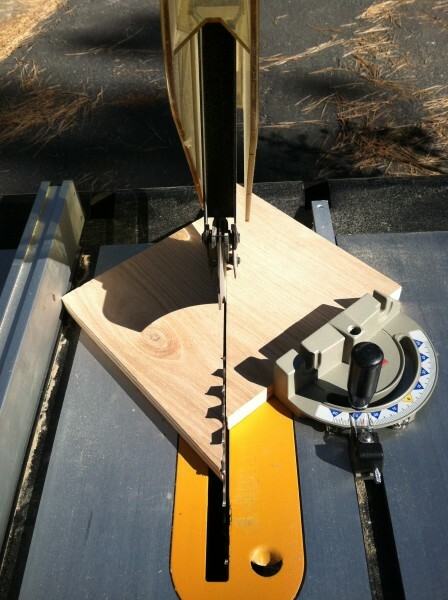 Now you know why I was cutting wood triangles! I drilled a hole in the CD holder under the ashtray in order to pull the power and antenna cables through. 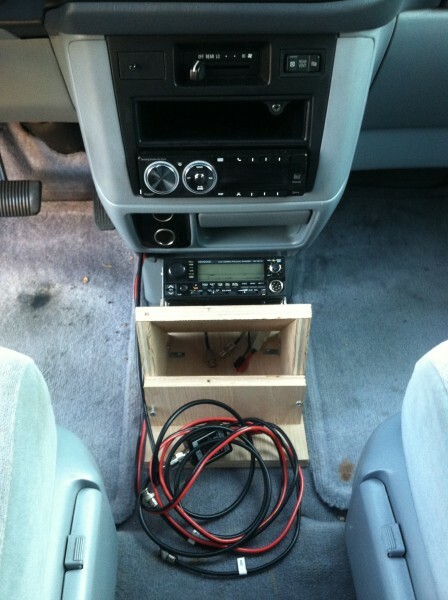 Those cables will be stored in the CD holder when the radio is not in the van. Also, I was originally thinking of bolting the console to the floor, but it doesn’t move around at all when driving, so I’ll simply leave it freestanding. 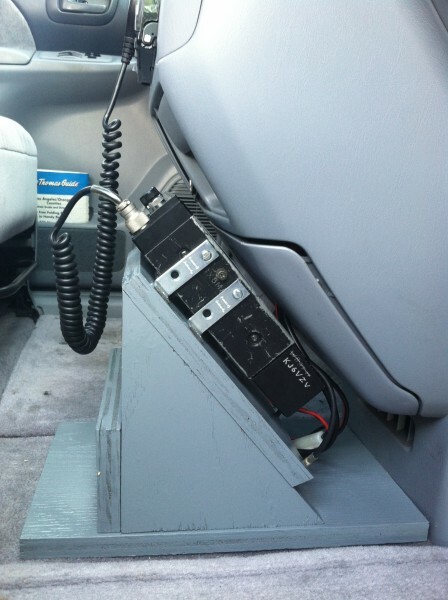 Here’s a closeup of the compartment under the radio. There’s room for the radio duplexer (center) and the “always on” cigarette lighter socket (right), rated for 15 amps and with its own fuse. 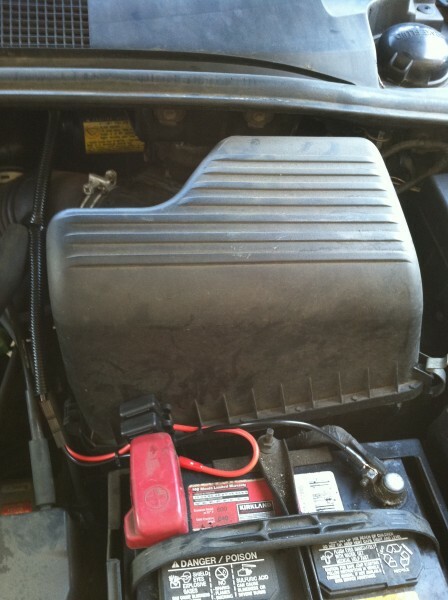 The red PowerPole splitter (left) has four ports: (1) incoming power from the battery, (2) power to the radio, (3) power to the cigarette lighter socket, and (4) a spare to connect anything else. This entry was posted in Radio on September 20, 2012 by BikingBrian. Question for you, how did you get the electrical cables for the radio through the firewall? I like the setup. Nice and neat.